Is Jurassic Park just around the corner? 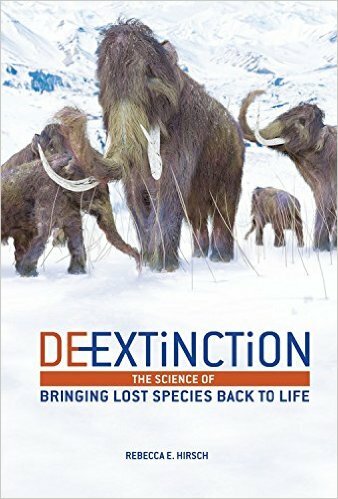 This book about finding ways to bring extinct animals back says very clearly that we won't be seeing dinosaurs and carefully explains why that is. It does, however, show the steps that are being taken to bring other extinct animals back to life. Complicated science is presented in a comprehensible way - or as comprehensible as it can be when you are explaining pretty dense topics. (There were times I was still a little lost.) While reading, I was beginning to wonder if we would ever hear about more than mammoths and wondering why we'd want to resurrect them anyway? But then we segued into Asian elephants and how mammoth DNA might help their flagging populations and I was back in it. Even more so when I learned about how elephant/mammoth hybrids could help the mammoth steppe. One thing I appreciated a lot was the presentation of science as unquestioning reality. That might seem obvious, but in our current era you can just take that for granted. Evolution, the fossil record, DNA, climate change, and more are discussed as the facts they are with nary a "many people believe" intro to lessen the impact of the facts. A really interesting, thoughtful, objective look at environmental issues and how science is working on them.